Logistics is the term given to encompasses the movement of goods from Export to Final Importer but there is a lot that happens in between. An Irish Exporter will make a sale of Goods to a German based Importer. The Irish Exporter will employ a Freight Forwarder to act as an Architect of Transport and facilitate selection and booking of transport providers and the documentation required. The Transport/ Haulage company will collect the goods from the Irish Export and transport the load via may different combinations of options; drive to Dublin Port, take a Ferry to a western port of the UK, drive across land, take another ferry to Rotterdam in Netherlands and then drive the remainder of the journey to Germany. Even when finally imported, the German based Importer will then employ the services of a local Distribution company, that will have the local knowledge and facilities to handle the final mile delivery of the imported goods to retailers/ end users. The above is a simplistic overview of the process. Freight, Logistics, Shipping and Distribution providers would have the knowledge required to handle the different facets of this process from project cargo (requirements for a box of finished Fairy Doors vs Wind Turbines) to crossing different borders (Switzerland is at the centre of the Europe but as they’re not an member of the European Union, specialist documentation is required) and other regulations that are required (Handling Dangerous Goods). There are many roles available along the Freight, Logistics, Shipping and Distribution industries. 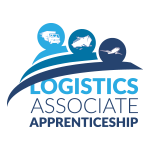 The Logistics Associate Apprenticeship will provide academic knowledge of the connecting parts of the Irish Logistics industry and experience within the workplace. Upon completion, Graduate Apprentices will be able to choose their own path to further their career, with experience and a qualification on the national framework of qualifications as solid foundation to spring from.